Launched with much fanfare this summer, the Aygo X certainly marks the spot when it comes to achieving a compact city car that packs a punch. Developed alongside the Peugeot 108 and C1, the Aygo is nippy and standouts from the crowd, with the X design splashed across the grille that shows its distinctive attitude. A creative campaign promoted around the tagline “Go Fun Yourself”, Toyota have teamed up with online pranksters, comedians and YouTube stars to create a campaign that reflects both the exterior and interior fun that’s packed into this sporty and compact car. Grabbing attention is what the Aygo is all about, with expressive designs customisable at the click of a button. Inside, the model is both longer and wider than ever before, providing more space for you and new technology that delivers responsive driving that fits to your lifestyle. Power assisted steering keeps you agile whilst the performance panel is primed for personalisation, providing feedback on the Aygo’s progress exactly when you need it, including fuel consumption, smartphone connectivity and control of in-drive entertainment. The x-shift gear paddle (available in the x-play and above) creates a receptive driving experience that promotes both comfort and higher performance. Toyota have achieved the perfect combination of efficient space and safety, with both VSC (Vehicle Stability Control) and ABS maximising driving control. Choosing from the range of accessories is where the fun really begins, with a selection of front mudflaps, side mouldings and scuff plates allowing complete customisation. Colour wise, there’s a palette of choice for all tastes, including the signature Red Pop and head turning Deep Blue Buzz. Available in 5 base models, ranging from the entry X to X-clusiv, all arrive with an economical 1.0 engine that when combined with the innovative lightweight frame delivers smart power reaching over 67mpg and a top speed of 99mph. You won’t be left wanting more from the new Aygo. 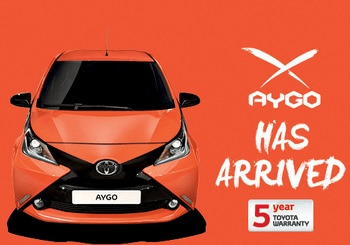 Get more information on the Aygo today & visit your local Howards Toyota dealership!